I designed this Twin Leaf Lace Cloth for the MDKAL Q4 Exchange. Since the cloths are on the small side (about 6 1/2 inches square after blocking), I made two for Cheri (my exchange partner). This is my first time participating in the dishcloth exchange. Here is a photo of both cloths. I still can't get the colors to come out right in my photos. The picture above was taken during the day, and the pictures below were taken at night. The nighttime shots always look much darker/duller, but the blue cloth isn't quite as bright as the picture above. I usually take my photos at night, after M has gone to bed, it's just easier for me that way, otherwise she tries to grab my knitting before I take my photos, or she's leaning/pushing up against me and I get more unfocused/blurry pictures. 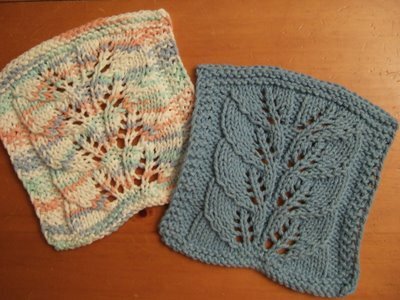 I made one cloth in a solid blue, and I was aiming for a variegated to "go" with the solid one. The variegated one has some blue in it but I couldn't get an exact match. If you can do my Vine Lace Cloth, then this one just requires a smidgen more concentration to knit up. If you're new to lace knitting, see my tips below. Please look at the Notes at the end of the pattern before starting. Using WW cotton yarn and US7 (4.5mm) needles, cast on 32 stitches. Repeat Rows 1 through 8 three more times. /2 = Right slanting (double) decrease as follows: SSK, then slip the NEXT stitch over the stitch just made by moving stitches from needle to needle. ----- Viz. Slip 1 stitch. Slip another stitch. Knit these 2 (slipped) stitches together. Move this resulting stitch to the left needle. Now use the right needle to pass the NEXT stitch over it (the stitch you just moved to the left needle). Now slip the stitch back to the right needle. ----- See below for further clarification & walk through if this still does not make sense. Mind your yarn overs, especially the 2nd YO on Row 2 (the one just before P2). This is an easy one to screw up if you're not paying attention. 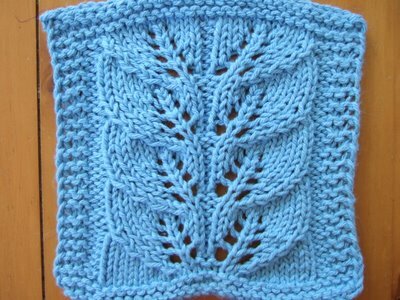 - If you are working the P10 section and run into the center 2 Knit stitches before you have finished Purling 10 (in other words, you are short 1 or more stitches), you most likely missed one (or more) YOs from the previous even row. Figure out where that is, tink back to that section (still on the even side), and pick up a strand of yarn from the row below & wrap it around the left needle to insert that missing YO. If you don't feel comfortable picking up the strand to insert the YO, just tink back to the row before and do it the normal way. - If you are working the P10 section past the 2 center stitches and run into the P2, B3 section before you are done Purling 10 stitches (in other words, you are short one or more stitches), then you most likely missed one (or more) YOs from the previous even row. You'll need to figure it out, see tip in paragraph above. - If you seem to have 1 extra stitch before the 2 center stitches, then you might have forgotten the "pass over" part of the 2\ instruction from the previous row. - If you seem to have 1 extra stitch before the 2 center stitches, then you might have forgetten the "pass NEXT stitch over" part of the /2 instruction from the previous row. Gosh, I hope I covered most of the "pitfalls" of knitting this cloth. I've discovered that some people are having difficulties with the /2 and 2\ notation I have used in this pattern. Where did that come from? 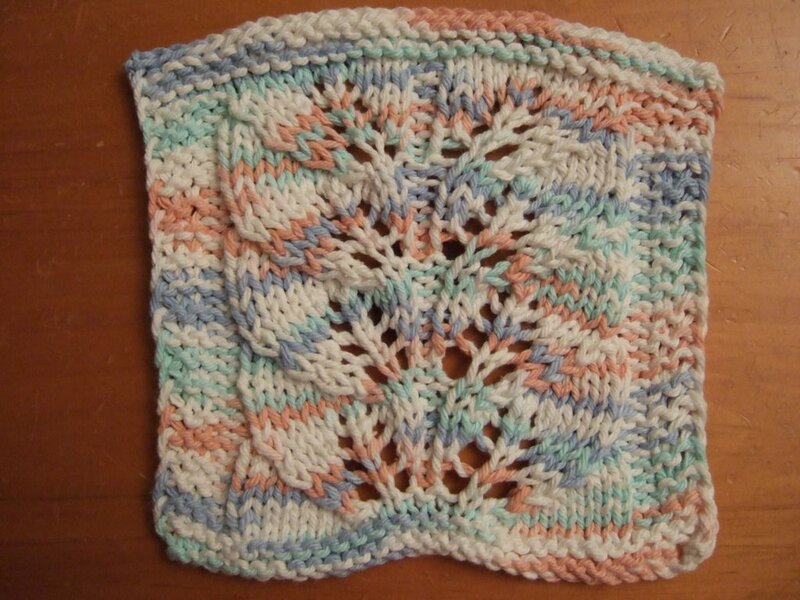 Well, I adopted it from Jackie Erickson-Schweitzer's Elegantly Simple Baby Blanket pattern (which I made a while back) where she used /3 and 3\ for her right & left triple decreases. The /2 and /3 are worked exactly the same, except that /2 is worked over 3 stitches, and /3 is worked over 4 stitches. Similarly with 2\ and 3\. I thought it would be easier to use her shorthand, rather than writing it all out. I guess choosing to adopt Jackie Erickson-Schweitzer's abbreviation was not such a great idea, huh? 1. Slip 1 stitch knitwise from the left needle. 4. Move the resulting stitch from step 3 to the left needle. 5. Now use your right needle to pass the NEXT stitch (the one to the left of the stitch you created from step 3) on your left needle over the stitch you just moved to your left needle (the stitch you created from step 3). 6. Now slip the stitch from your left needle back to your right needle. Voilà! You're done! Clear as mud? 1. Slip 1 stitch from your left needle to your right needle. 2. Knit 2 stitches together from your left needle. 3. Pass the slipped stitch (from step 1) over the stitch you created in step 2. Voilà, c'est fini. I have since discovered that what I have been calling SK2TP is more commonly known as SK2P. Sorry about the confusion, I'm a newbie knitter and didn't know this. You can find a video here that will show you how to do this. Scroll down on the right side column until you find "SK2P" and then click on the video icon. S - these are very pretty. You're getting to be quite the maven! I've noticed with a lot of verigated yarns that the solid colours of the same line don't match exactly. Especially the cotton yarn like "Handicrafter". Why can't they make it match?! And I love the pink and white hat! I think I've got to make that! Neat patterns. 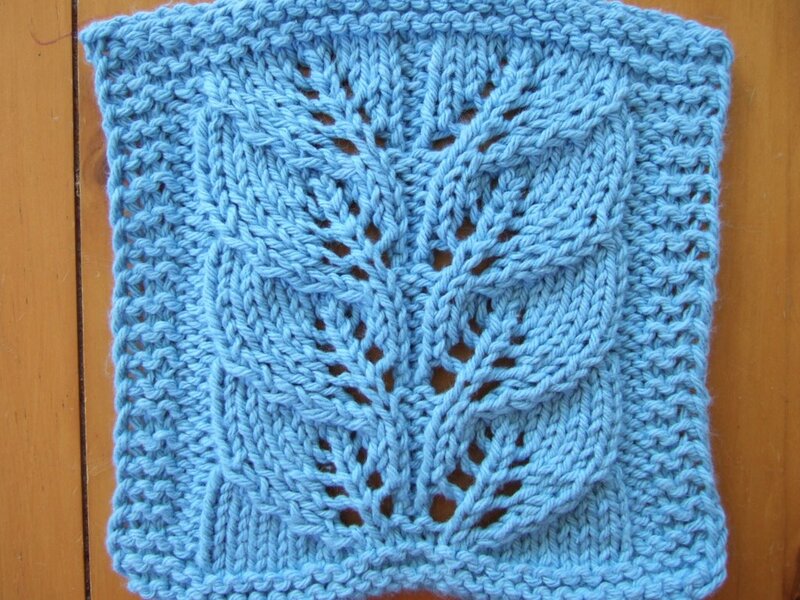 Have you seen the Sugar and Cream dishcloth design contest? http://www.sugarncream.com/theoriginal.php You should enter! slip one stitch over, slip another stitch over, then using my left needle I go through the front of the two slipped over stitches and then knit them and then slip that stitch back over to the left needle, then slip the stitch before that one over. I just knit this up and i love it. I turned them into potholders and their off to england for a swap. thanks for the pattern. love it so much, thanks for sharing!